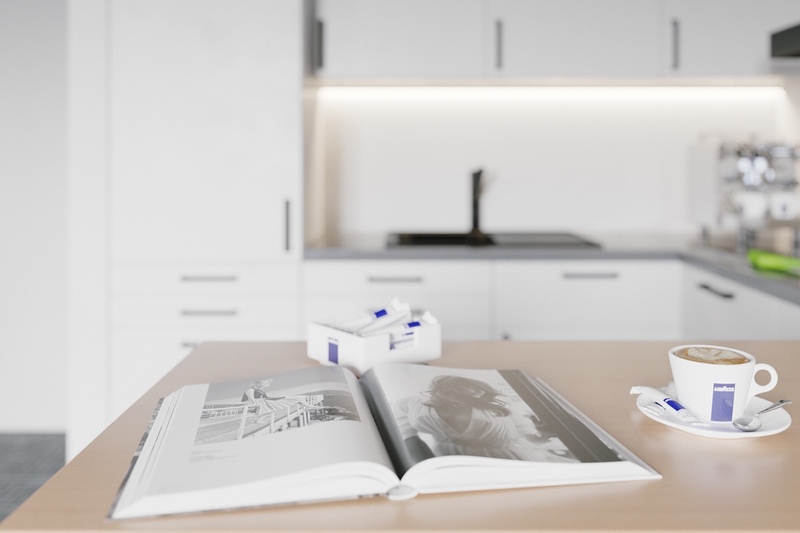 Buying your first home can be a messy business. 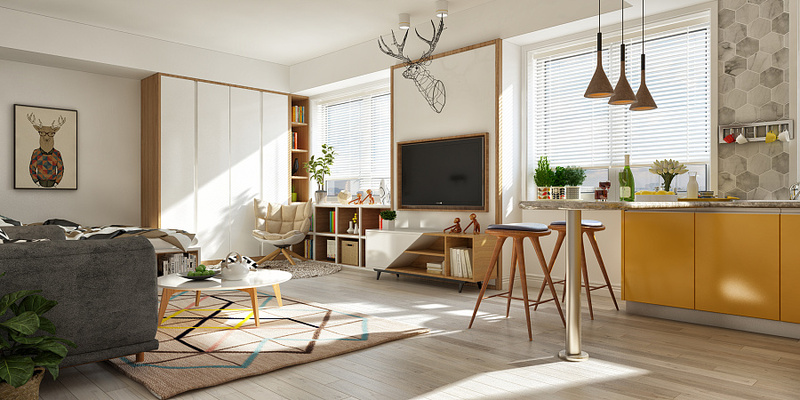 Finding a good location, the right amenities, and a space you’d like to live in all present difficulties. 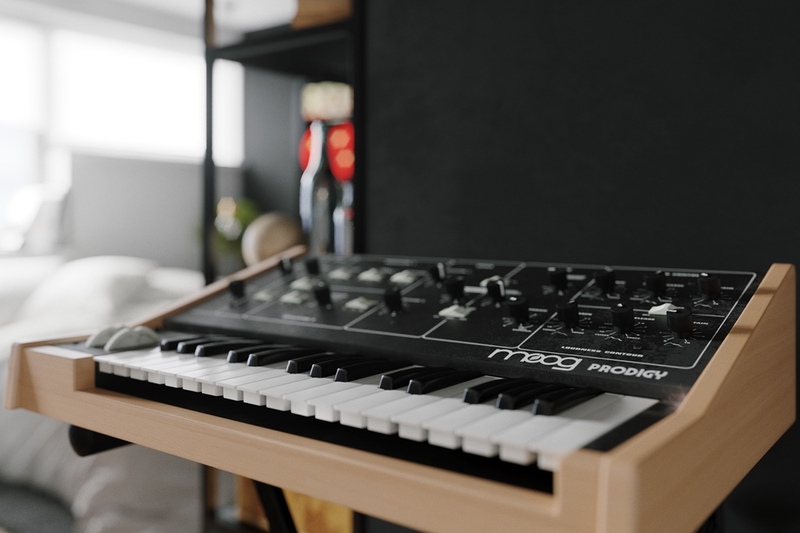 Decorating your first interior is no different. 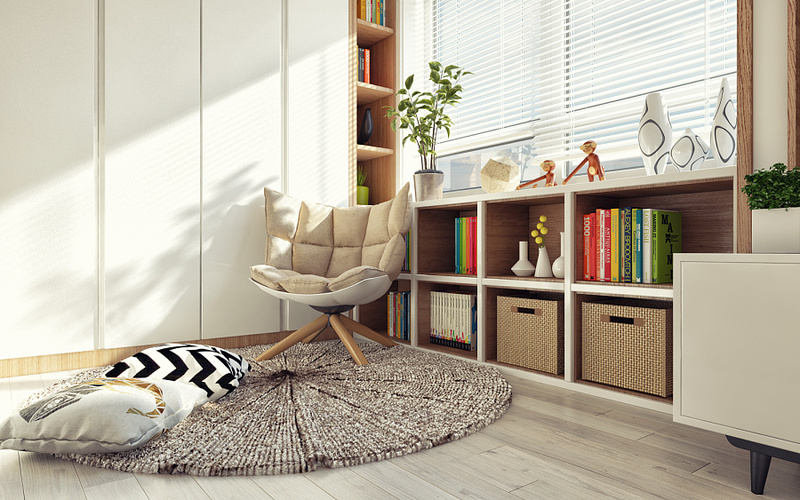 How can you find the easiest and most cost-efficient way to make your small space shine? 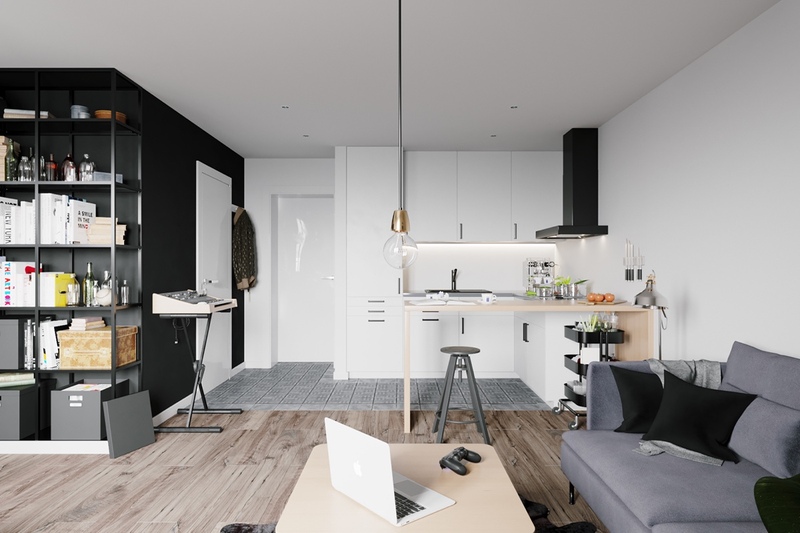 These four examples of Scandinavian design show how to make the most of your home, on a range of budgets. 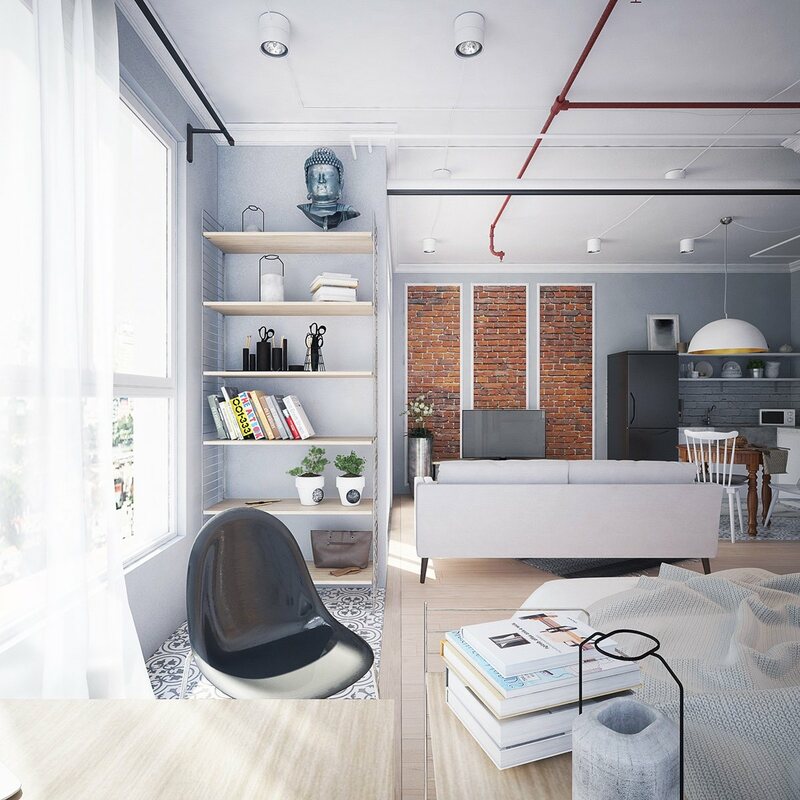 Showing four small spaces, they each use a combination of wood, brick, textiles and colouring to make your home functional and beautiful. 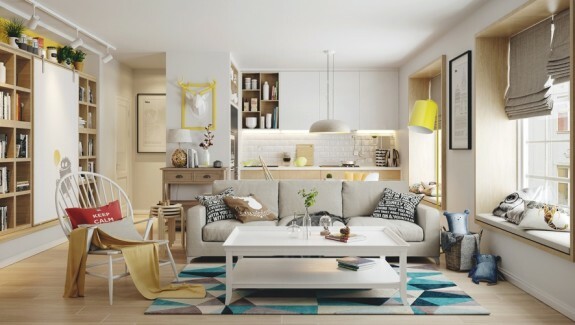 Take a peek to get your first home on the right, Scandinavian-inspired, track. 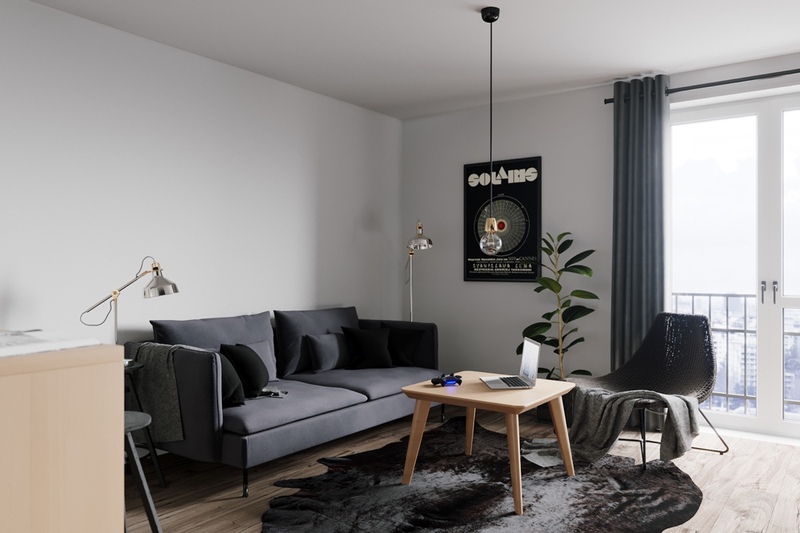 Our first design in Warsaw, Poland, measures only 30sqm. 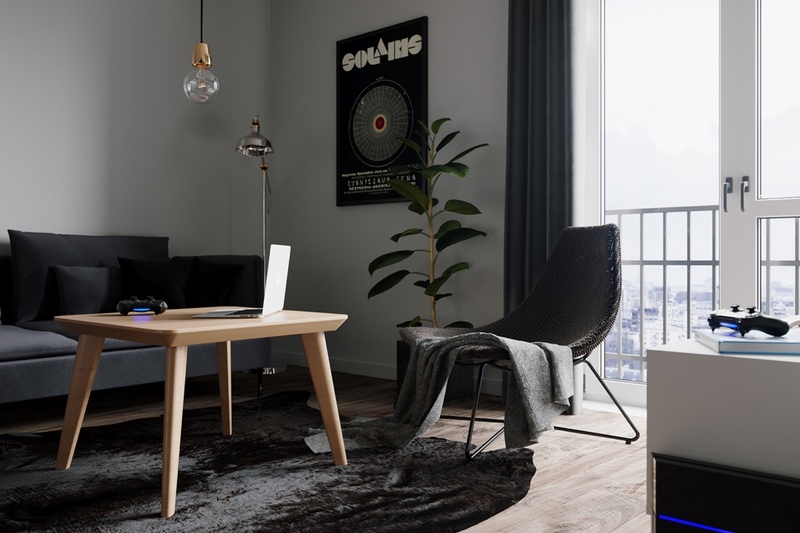 Using furniture from IKEA, its contemporary yet light look is perfect for a first home owner on a budget. Clad in grey walls, the lounge opens up to a space centred by a floral papier mache light. 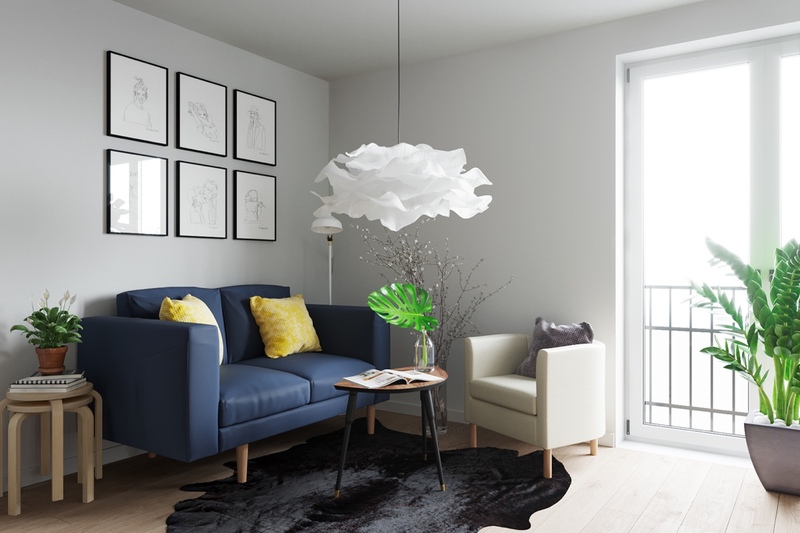 Six figure sketches ground a blue couch, while a black mock hide holds a beige counterpart and steel and wood table. 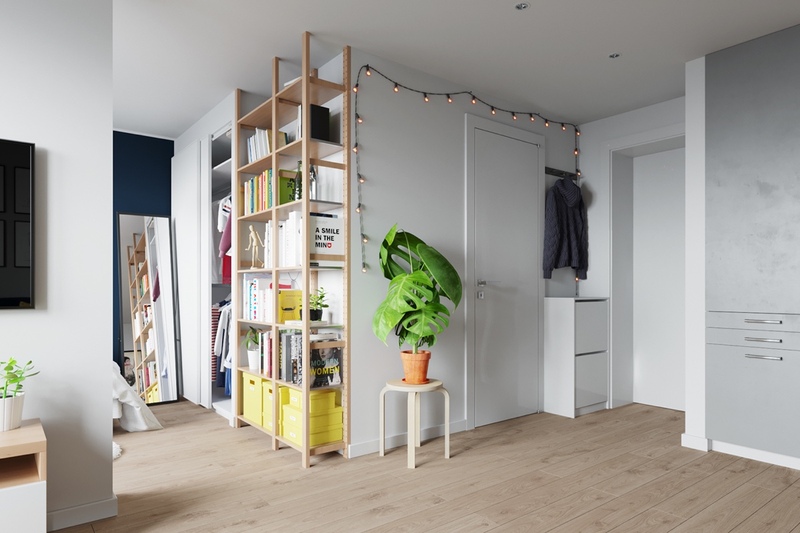 Lit by a balcony streaming over a light wooden floor, the rest of the room holds plants, a row of fairy lights and a Scandinavian bookcase in a functional, breathable space. 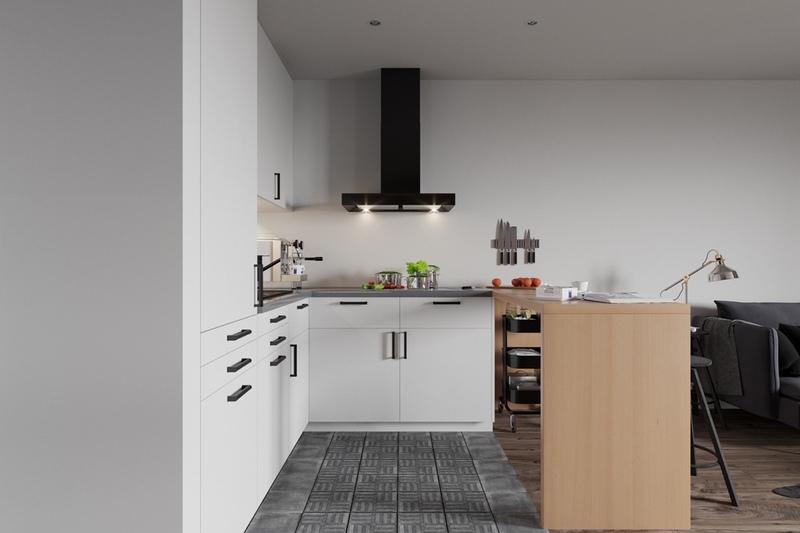 A turn around shows a simple, classic example for grey kitchens. Forming an L shape beside the entrance, grey marks the kitchen spot without dominating the room. A row of white cabinets blend into the wall, which hold another row of white potted herbs. With a white breakfast table headlined by an art deco print, the space screams relaxation with a dash of character. Blue points out the bedroom, with a midnight feature wall. Featuring a papier mache flower similar to the lounge, a white bed matching surrounding walls creates an open and airy feel. 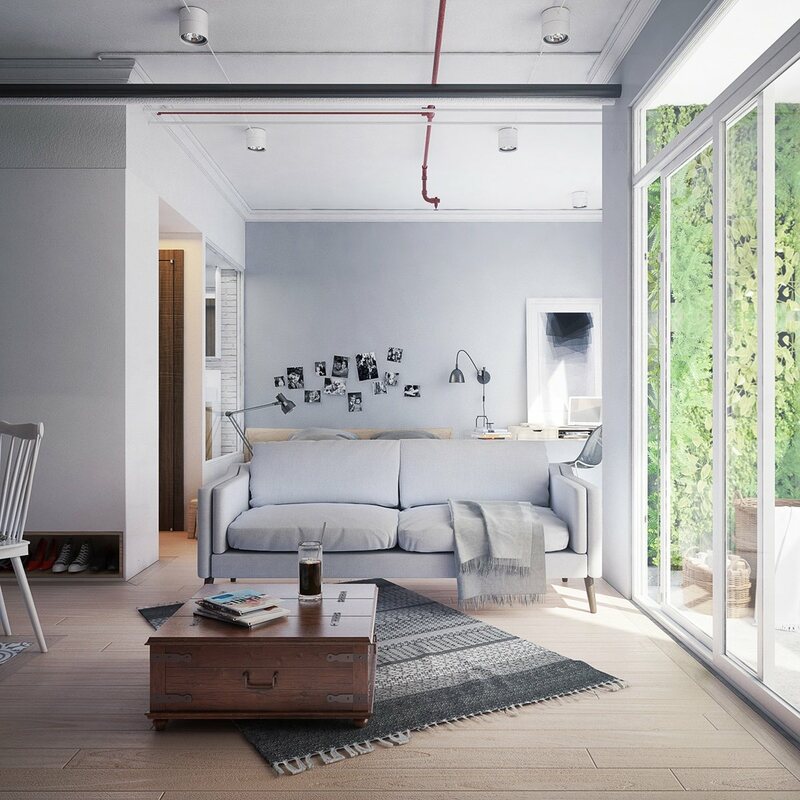 A leaning mirror extends the room; a white fluffy rug makes it cosy. 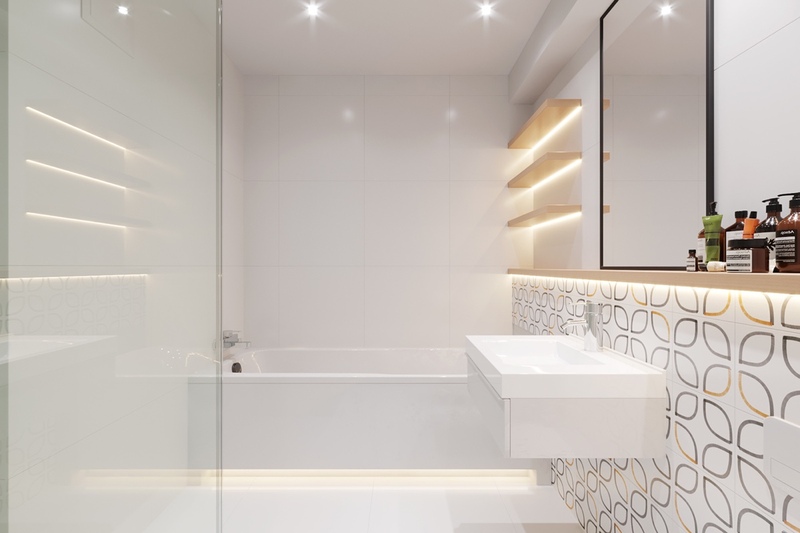 The bathroom is an exemplary use of space, lined with strips of LED lighting. 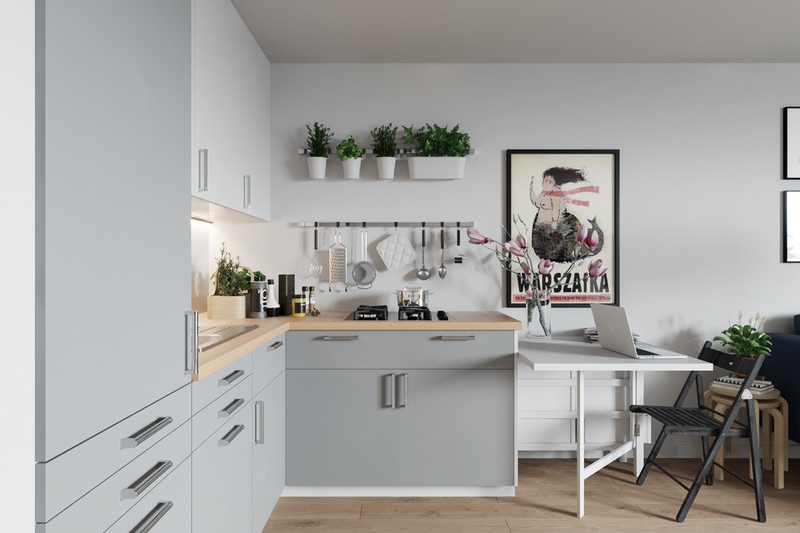 Clothed in white tiles and glass panes, Scandinavian wooden shelving offers a low-key place for essentials. A mirror and gold-patterned tiles provide a space for preening, as a white porcelain bath fits snug into the corner. 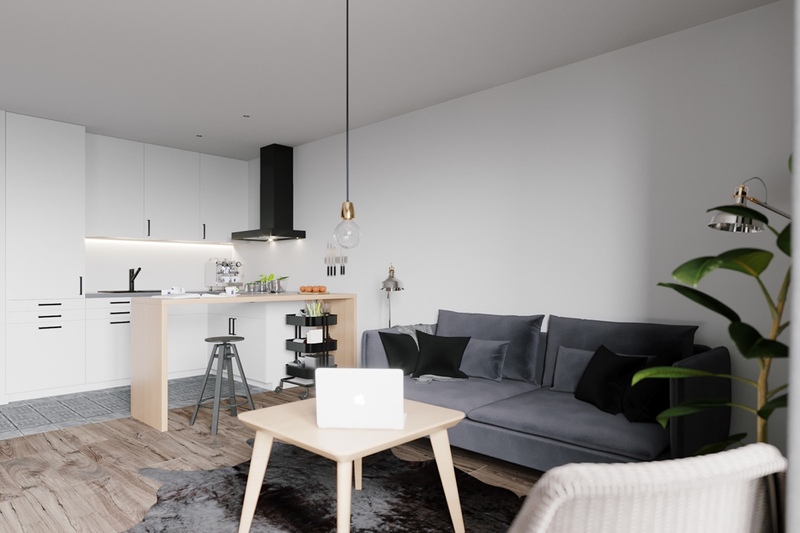 Designed by the same studio, our next Warsaw interior is a bachelor’s haunt. 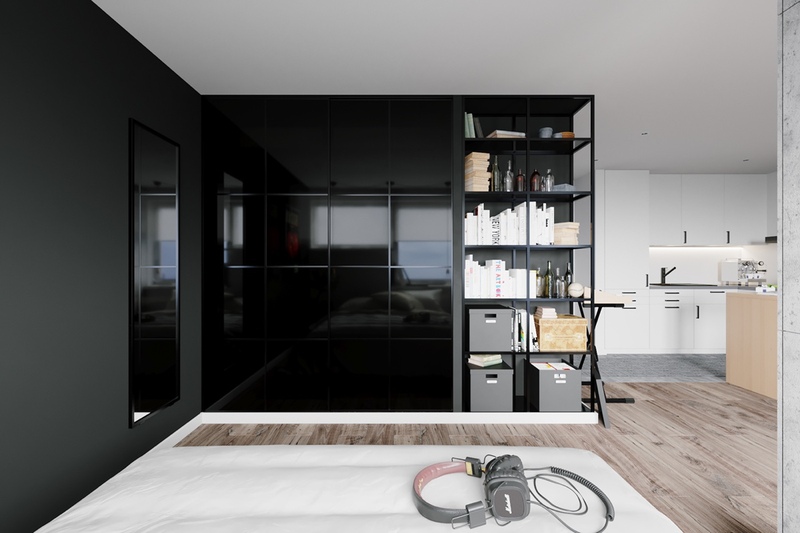 Featuring darker, more contemporary elements, it uses a tight 35sqm space to upgrade and optimise each apartment corner. 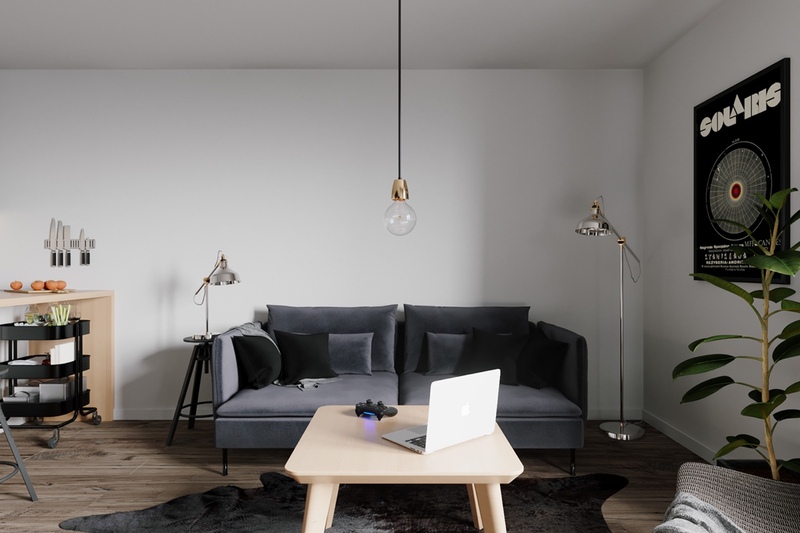 Leading in with the lounge, a stand-out idea light drops ceremoniously from the ceiling, a simple yet effective statement. Surrounded by white walls, a velvet couch and coffee table mix with a breakfast version and trunk of a tree. As a 1972 Bertrandt poster says Solaris, two hover lamps stand and sit simultaneously. Paired with a black-skinned rug, the look is personal, contemplative – and not overly daring. 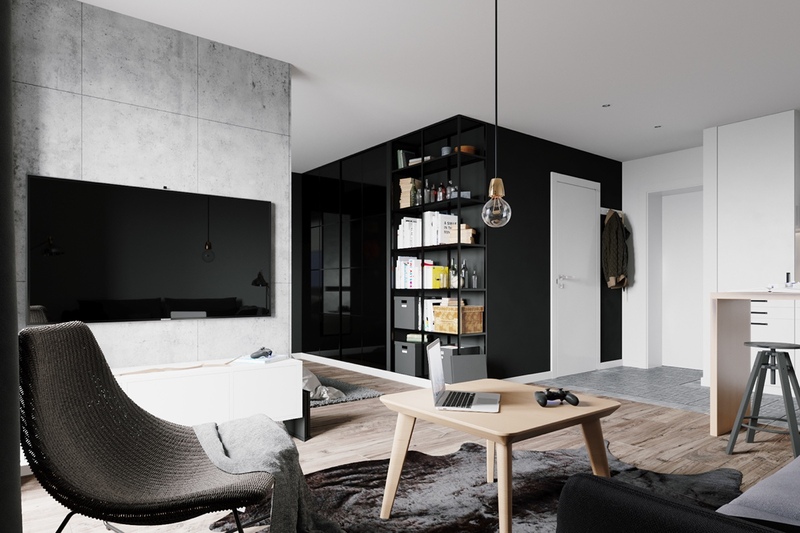 A black wall catches the eye in a bold and masculine move. 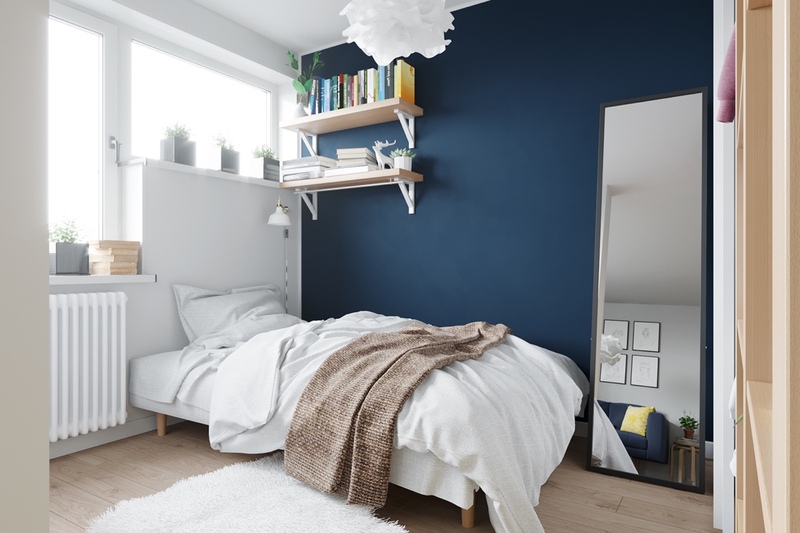 Hosting a stack of Scandinavian shelving, its dominance reflects off a mirror and saves valuable space. 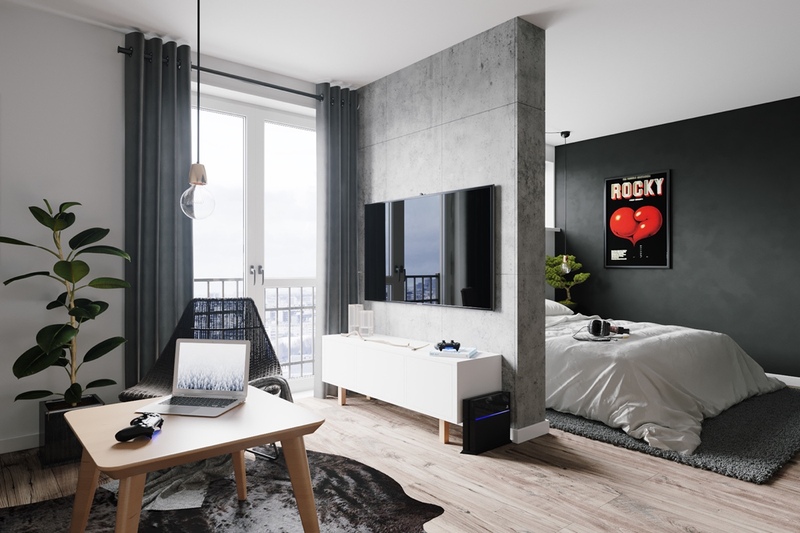 The star of the interior, it provides a sleek feature wall for the bedroom, a leader for a concrete counterpart, and a wrap-around entrance for guests. Continuing the bedroom’s black side wall, it contrasts against light-wooden floors whilst matching the poster, rug and TV from the lounge. 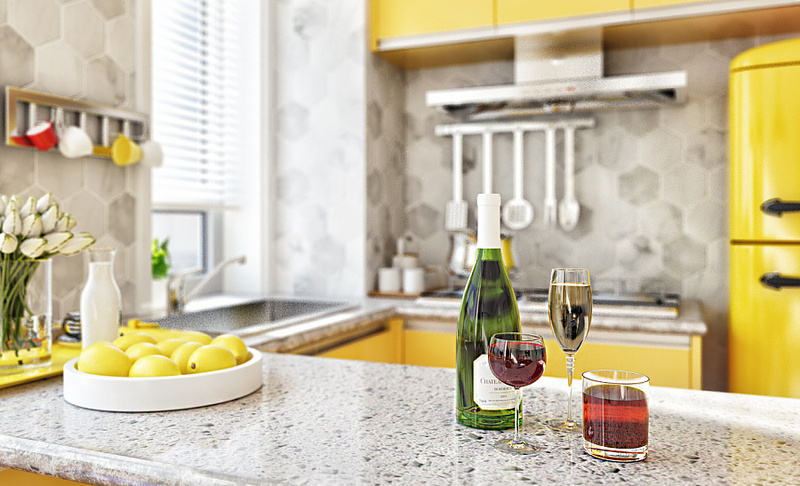 A look to the kitchen creates difference again, as its walls shine in lighter hues. 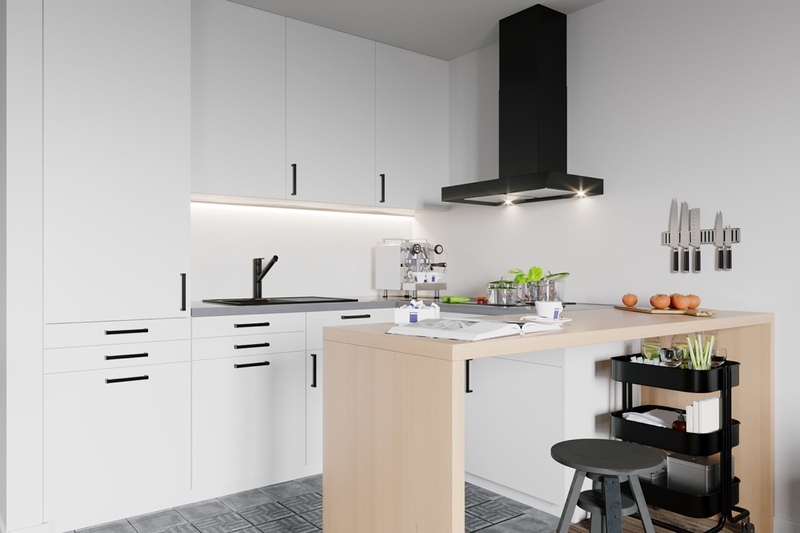 More muted than many black and white kitchens, its white cabinets pair with a black extractor fan for a monochrome meal-making space. 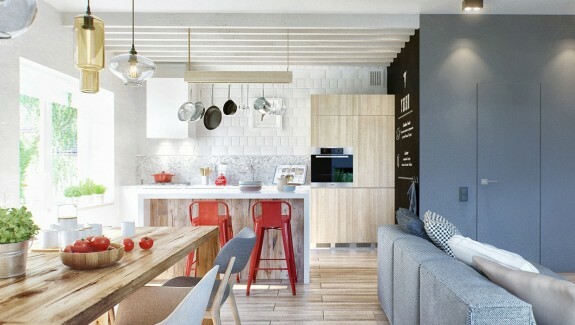 Floored by grey tiles and rimmed by grey bench, its light-wooden island both opens the space and refers to lounge furniture. 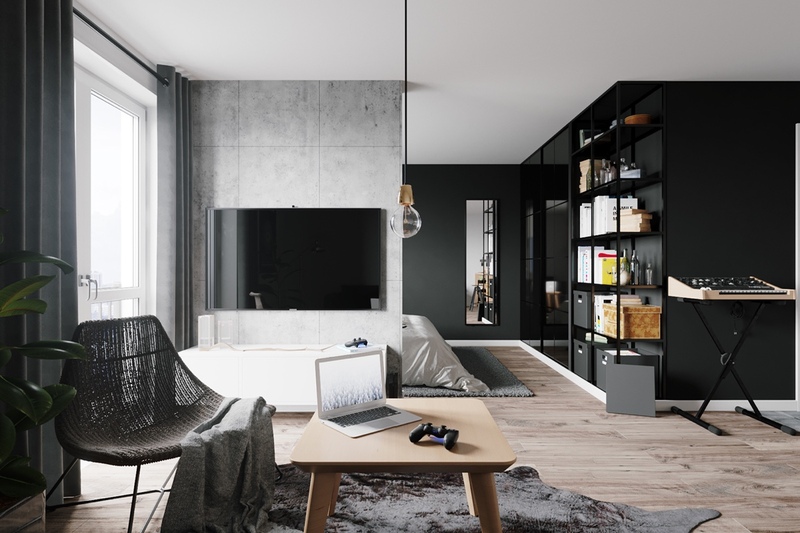 Not to compete with the black feature wall, it provides a functional space that keeps the interior classic, clean and contemporary. 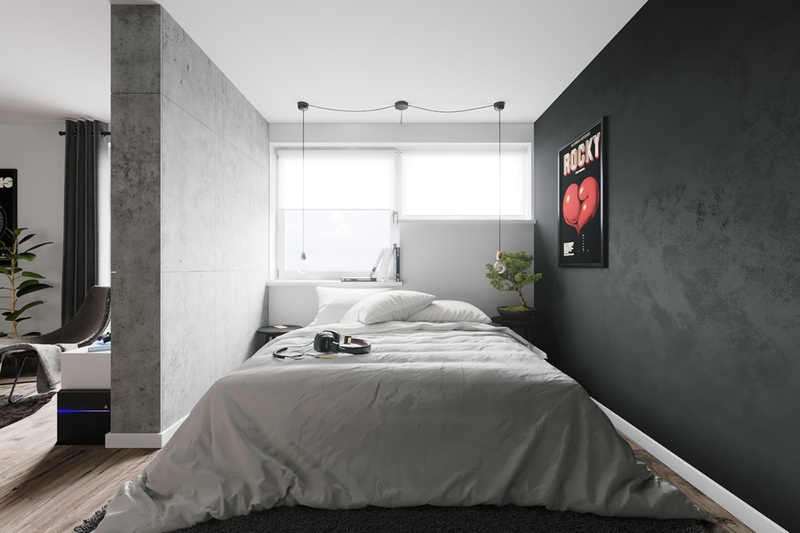 Hugged by black and concrete, the bachelor pad is centred in the bedroom. 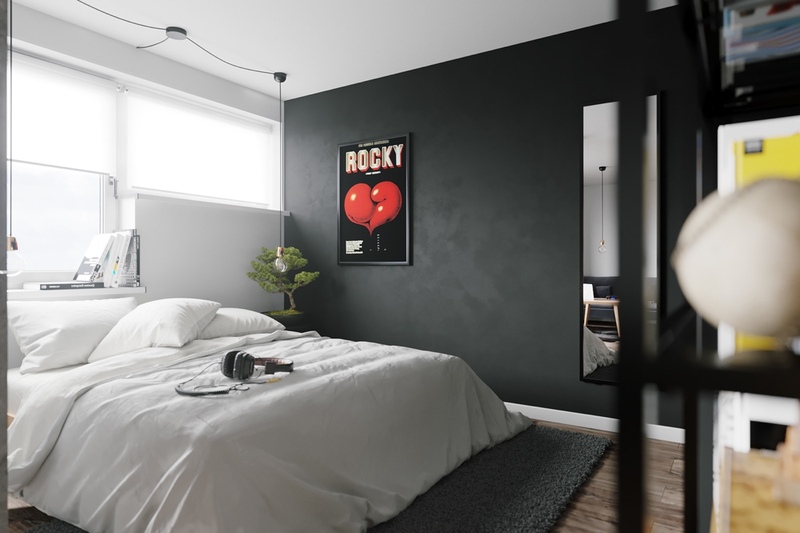 A Rocky poster by Bertrandt welcomes in the viewer, as a half-window behind lights it up. Lit at night by two idea bulbs either side, the bed relaxes in casual white on grey, leading to a keyboard for a before-bed jam. 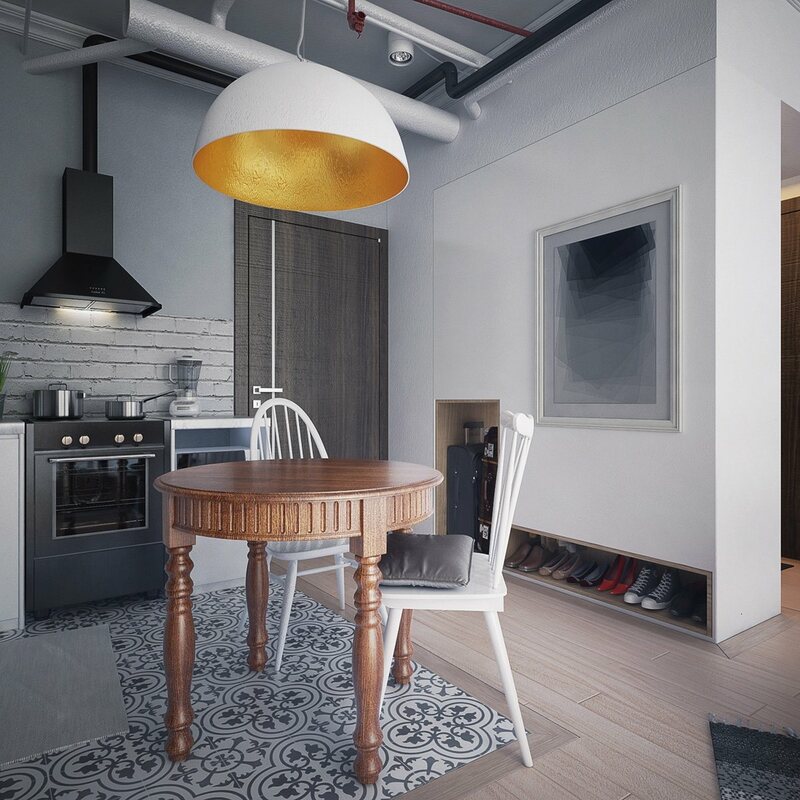 Looking diagonally, its greys, whites and blacks match the kitchen, while forming a decidedly-individual sleeping space. 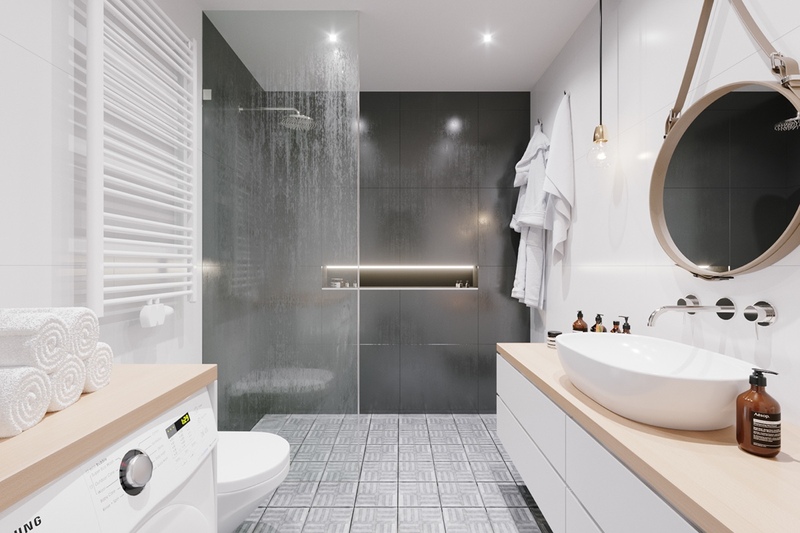 The bathroom creates another vibe, using the same Scandinavian influences. Lightened by white tiles and a proliferation of wood, the focal point lies in a granite L-wall at the back. 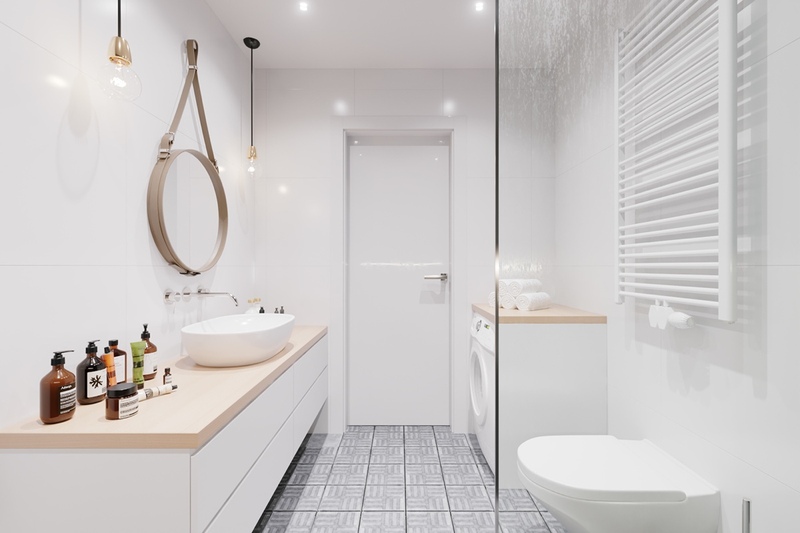 Grey tiles from the kitchen lead into two walls holding white and wood; one with a towel rail and toilet, the other with idea bulbs and a hanging mirror. 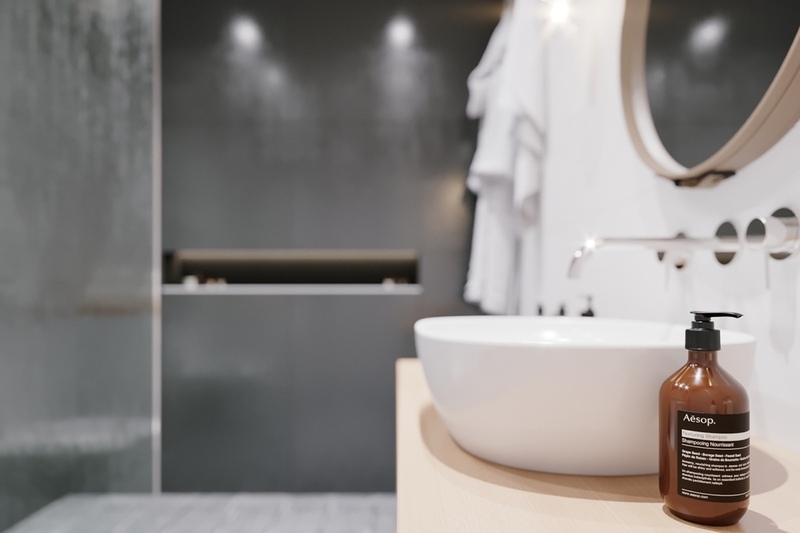 Cleverly masking a washing machine under wooden cabinetry, a few soaps and lotions act the feature in a shower-built LED panel. Mustard is the word for our next interior. 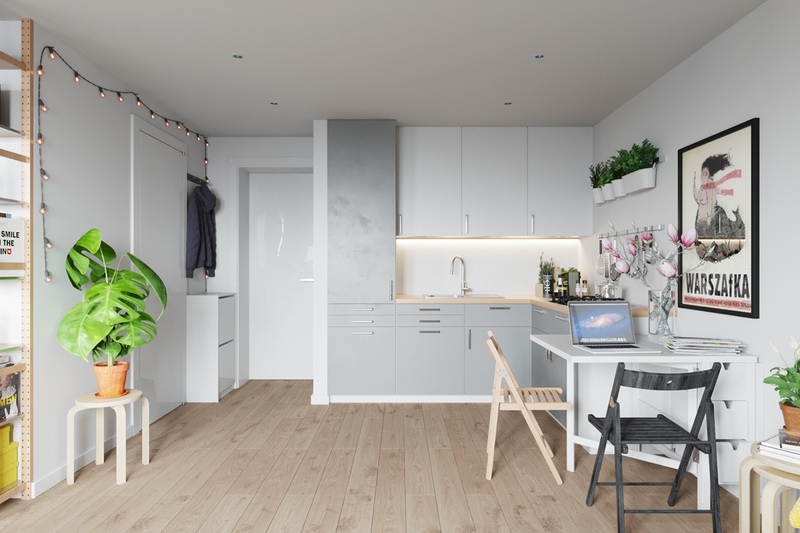 Designed to fill one room, the bedroom, lounge, kitchen and dining areas form a relaxed Scandinavian centre. 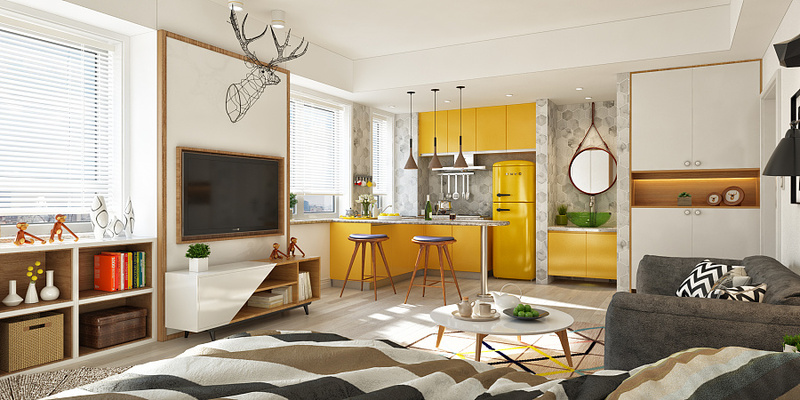 A range of white and mustard cabinets catch the eye on the front wall, holding a TV-towering metal stag. Matching a Christmas deer above the bed, grey wooden floors lead to a row of high cabinets, a bookcase-held bed, and an array of framed prints. 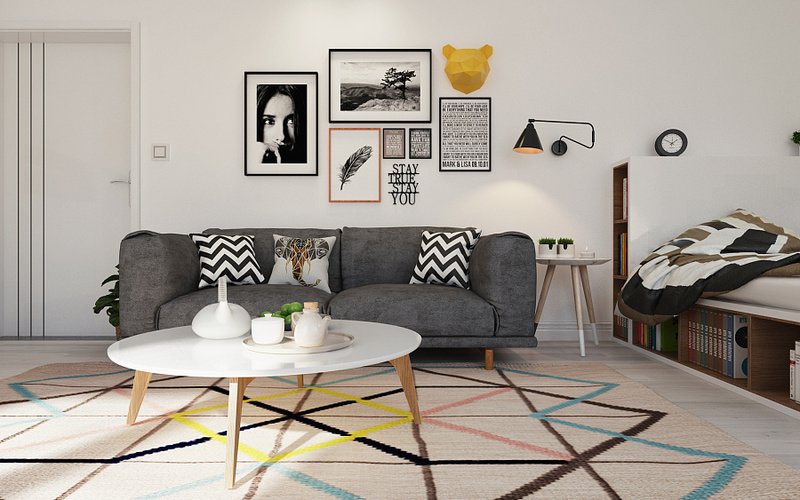 A large geometric rug adds dashes of colour afront a couch peppered with cushions. To the right, mustard catches the eye again in an L-shaped block. 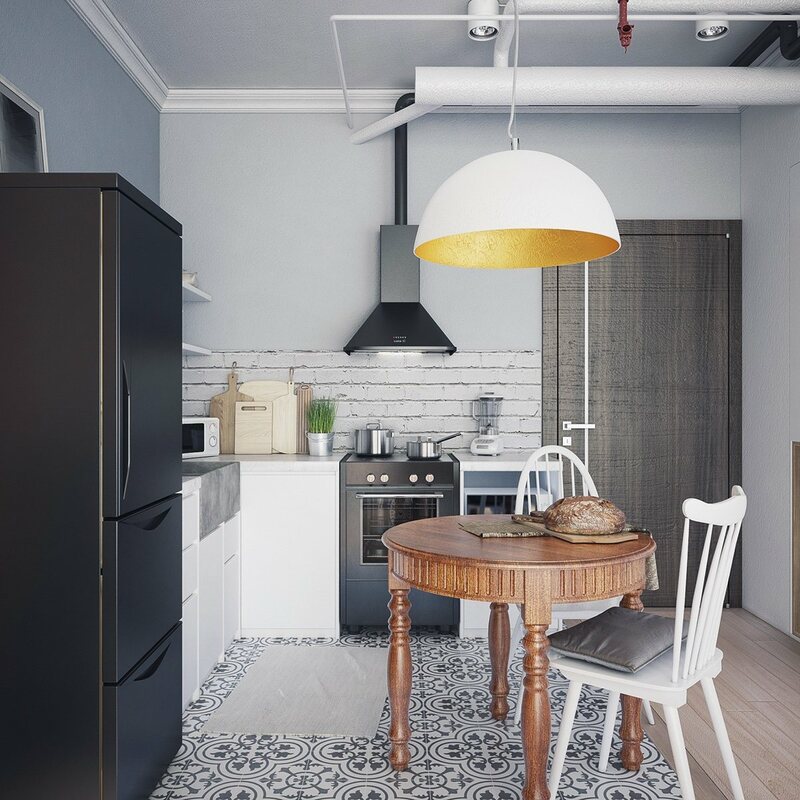 Marking the kitchen, its matching cabinetry and SMEG are lit by three hanging lights, which dapple over different-patterned benchtops and tiles. Drawing the viewer in, a chrome extractor fan and utensil row reveal a window to the side, lighting lemons. Each corner of the room offers a different delight. Clad in beige and grey tones, a reading spot to the left hides books in its walls and trinkets on its sill. 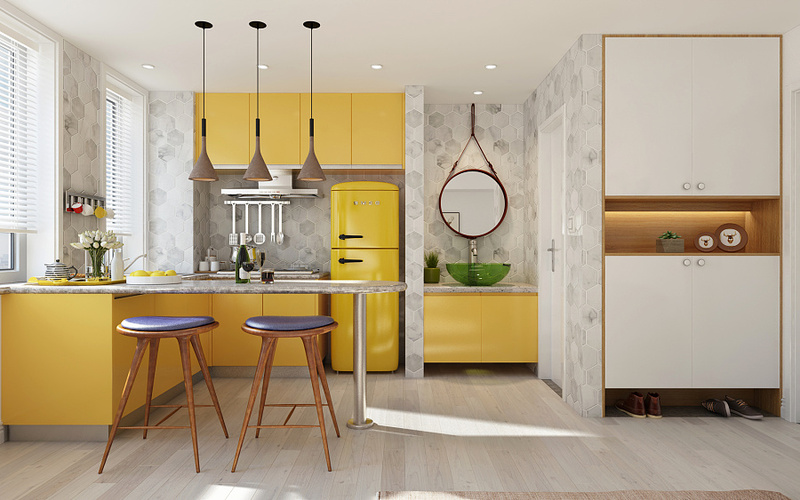 The most mustard of yellow kitchens, the opposing wall offers a bright eating space resplendent with a grey island and Scandinavian side cupboard. 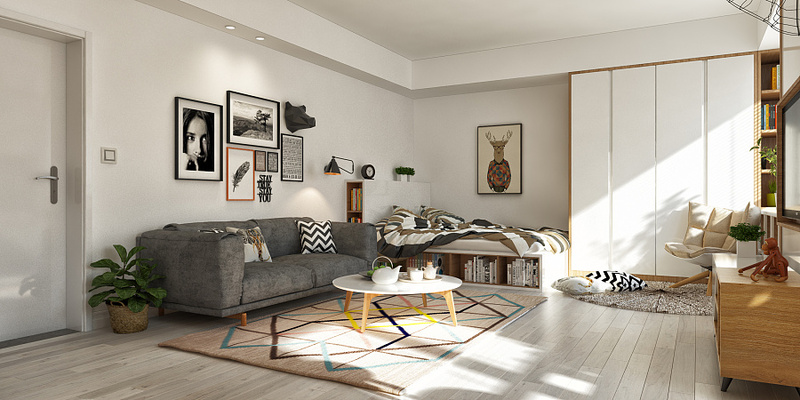 A turn to the right reveals the couch and bed relaxing, amidst sprinkled hues and textiles on a ranging wooden floor. Our final space sits at a grey-painted, brick-clad 40sqm. 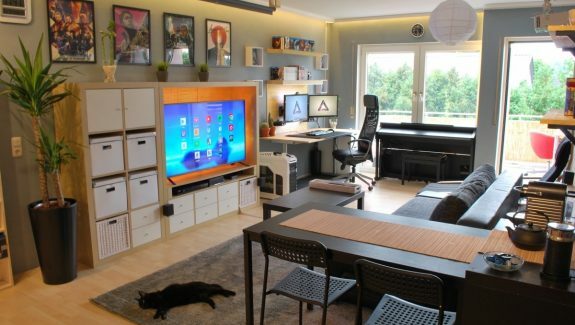 Another one-room interior, it comprises a living room, bedroom, kitchen and dining area in one compact frame. 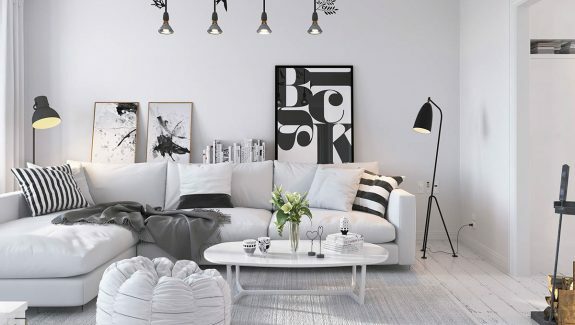 Facing the couch, walls swathed in light grey perfectly match its fabric, as a multi-hued rug, leaning abstract and black-and-white polaroids sit afront and behind. 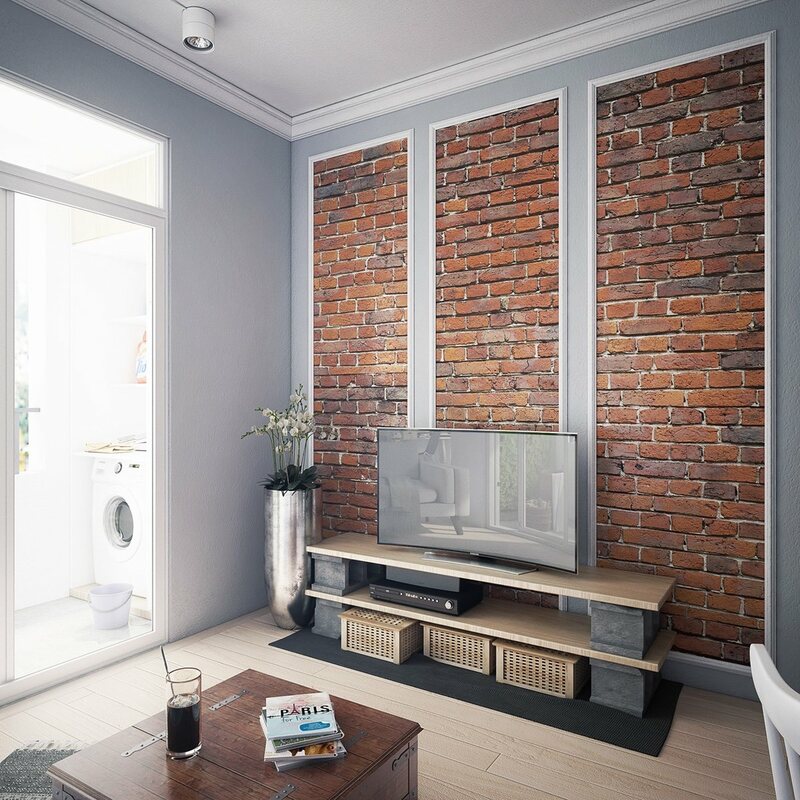 As a windowed door lights exposed brick, three stripes of grey intersect, adding a distinctive, almost French look. 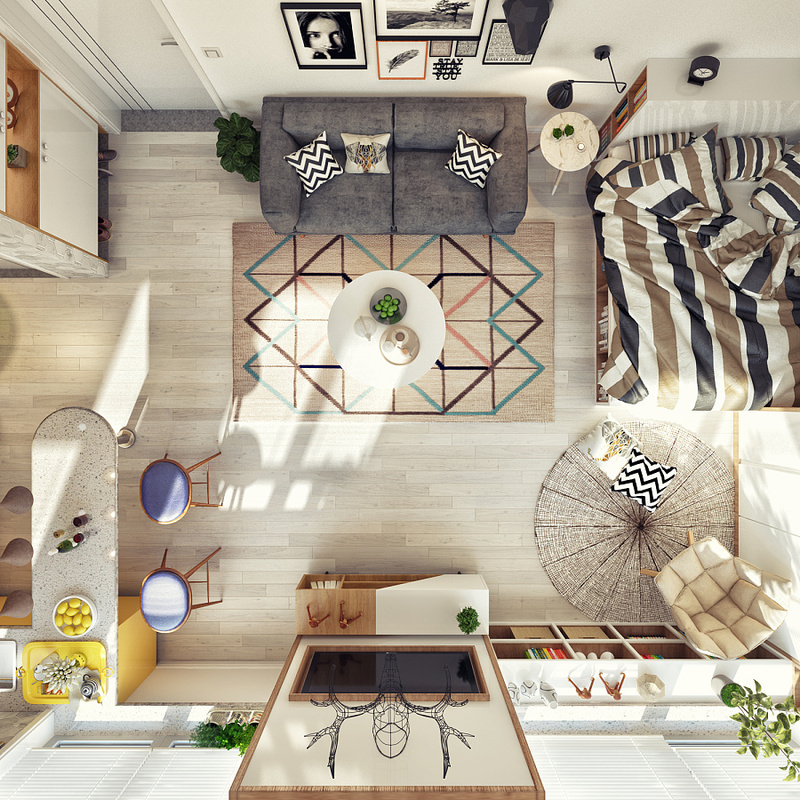 A range of wooden tones line the floor, TV cabinet and unique coffee table, creating a cozy place for evening viewing. Stepping back from the couch, the bedroom makes itself known. 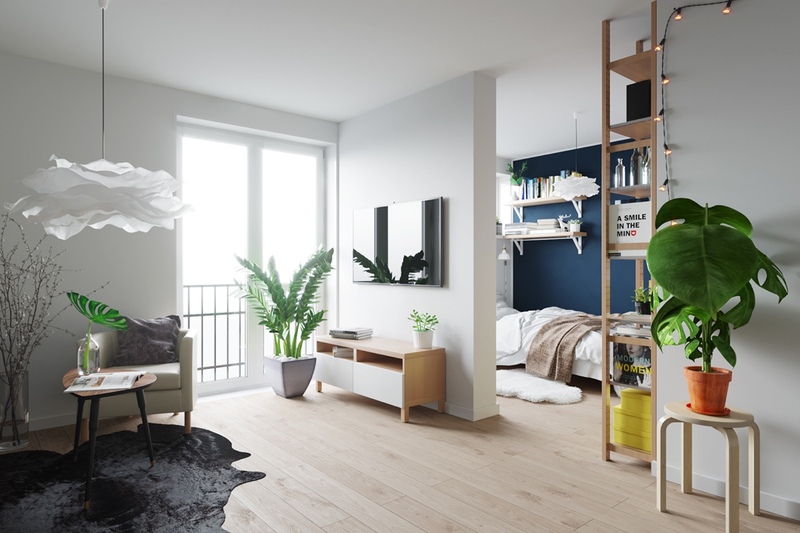 A column of Scandinavian shelves hold busts, books and potted plants, as a large wooden bed spreads across the space in white and grey. Using classic light wood, a row of wheelable boxes offer under-bed storage; a desk to the side, a place for reflection. Opening up to a window with a city view, a strip of Florentine lino fills a space otherwise empty. Grounded on the same lino, the dining room and kitchen hang a gold-painted dome over a round wooden table. 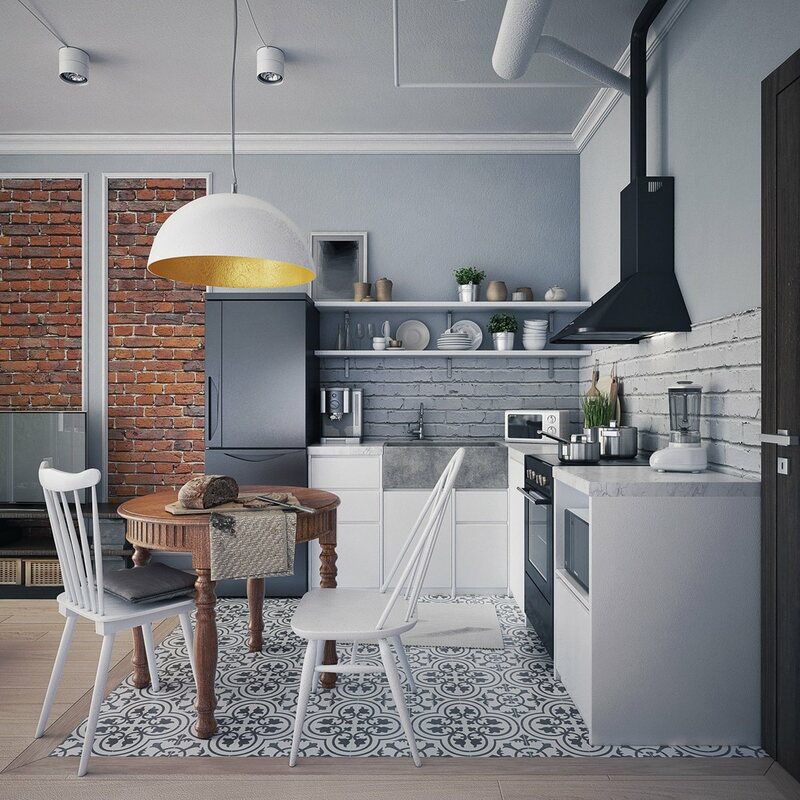 Drenched in grey wallpaper, the kitchen inlet affords a cameo appearance of distressed brick. A charcoal fridge and black extractor fan add the industrial beside Scandinavian potted plants, antique plates and chrome accessories. The entrance wall to the side hides the shoes.